Now, for the most part of the week, we spend our days hopping around in our cars and then park them for the night. Come the weekend, we would have already planned on going on a long drive. Well, if there is nothing that you are going to do over the weekend, then its time to give your car a bath. 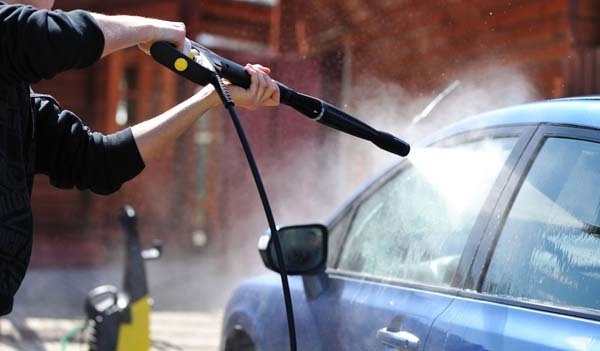 Over the years, I have conjured up a few points to take care while hosing down your car. I have listed them in this article. First of all, the requirements for washing a car are that one should need an open area. Washing a car inside the car garage is a strict no-no. A wash mitten, wheel brush, wash bucket, car soap, all wheel safe cleaner, some non glossy paper preferably newspaper and a dry towel. Once you have all these items at your disposal, rinse the car. I have seen many of my friends just starting over with the soap water rather than plain water first, it isn’t preferable. By just rinsing down the car with plain water, the car’s road grime and dust are removed to a larger part. Instead rinsing with soap water would yield to the car developing scratches in its paint job. Hose the car down from top to bottom so that precious water and time are saven. If you have a power washer, then don’t set it to the topmost setting. Some of the suspension components may give way in the wake of high pressure. Using the wheel cleaner to clean the wheels after the hosing is recommended. This would ensure that the wheels would be safe from any rust, if you have steel wheels instead of alloy ones. Also brush the wheels with the wheel brush to completely remove any hidden dirt and grime. It is advisable to complete the job on one wheel before moving to the next one. Ensure that the exhaust of the car is plugged with a cloth so that water doesn’t enter it. Now comes the next step of applying soap to the body of the car. The roof section should be the center of your attraction. After applying the soap, lightly scrub the body of the car in a clockwise direction. This would ensure that the soap is been applied in the right quantities and in the correct manner. After the soap work is done, rinse the car thoroughly. Now comes the time for drying the car, Don’t go for the traditional method of drying the car in sun. Use the dry cloth and wipe the car with it. Remember, the dry cloth shouldn’t have an surface abrasions and also it must be smooth one. It must be clean also. After you have dried the car with that cloth, you may leave it in the sun to dry for a while. The other part of the story is cleaning the interiors of the car. For this, you would require a vacuum cleaner, plastic cleaner, carpet brush, upholstery foaming cleaner and clean towels. You would have to remove the car’s floor mats, rubber cargo liners, dash mats and all the papers from inside the glove box. As was the norm earlier, start vacuuming the head rests and then move on to the down section of the car. All the crevices in the carpet should be thoroughly vacuumed. If at all you have pets and carry them around in your car, then there may be pet hair in the car that you would want to clear off. Start by vacuuming and then later on use a pair of gloves, dip them in soap water and wipe the floor. You would be surprised to note how much of the hair sticks to your gloves and in the end, your car would be much cleaner than you thought it would be. Clean the seating areas with the cleaners that you have brought along with you. Be sure to push and prod the seats if they are of the adjustable types. Carry along a packet of baking soda and spread it liberally along the length of the car’s interiors. This would ensure that any foul smell emanating from the car would be eliminated. Remember later to vacuum off all the extra baking soda. The gear shift boot as well as the steering wheel cover, if possible, should be removed and cleaned with the anti infectant. Different users of the car or handling of the car with dirty hands may lead to infection or some or the other diseases. Avoid using ammonia as a cleaning agent. It would interfere with the functioning of the glass windows, if they are tinted. It may also remove the protective film from the windows. Use the foaming spray to clean the carpet area or the upholstery. The carpet brush can be used liberally to ensure that remnants of the spray don’t remain. Now, since the car has been drying in the sun for a considerable amount of time, park it in a shade. Don’t park it under a tree though. Once the car’s surface has cooled down a bit, apply liquid wax or paste. As always, start from the roof, then move in the direction of the dash. Just go in the same direction and don’t start by using circular motion. This is to ensure that the surface seems as smooth as possible rather than have the cob web effect. Once the waxing has been done, use the dry micro fiber towel to wipe it off. Avoid using regular towel as this would cause scratches. Now, comes the turn of the windows and all the glass areas in the car. Use the newspaper to clean the glass surfaces. This is done to avoid swirl marks. You can also use a glass cleaner and it can be then wiped off using the newspapers. If the same tinted glass comes to scene, use a safe film window cleaner. The final see-over, ensure that you have cleaned the car from top to bottom, inside out. Remove the cloth from the silencer and you should be all done with the car cleaning job. Do let me know how this works out and if at all you have any doubts, let me know. Bu now it seems my problem is solved. I know the technique now (all thanks to you) and it seems it won’t take much of my time… though I really want to ask you how much time it will take.